In 1901, Abdul Rahman?s son, Abdul Aziz (the future Ibn Saud), asked the Emir of Kuwait for men and supplies for an attack on Riyadh. Already involved in several wars with the Rashidis, the Emir agreed to the request, giving Ibn Saud horses and arms. Although the exact number of men waxed and waned during the subsequent journey, he is believed to have left with around 40 men. In January 1902, Ibn Saud and his men reached Riyadh. With only a small force, he felt that the only way to take the city was to capture Al Masmak Castle and kill Ibn Ajlan, Chief of Riyadh. Ibn Saud?s force captured the castle and killed Ibn Ajlan according to plan, and took the city within the night. 1903?1907, Warfare period of sporadic battles ended with Saudi takeover of the al-Qassim region. In 1913, with the aid of the Ikhwan, irregular raiders traveled mainly on camels and some horses, Ibn Saud captured Hasa from the Ottomans. Ibn Saud annexed Al-Hasa and Qatif into his domain of Emirate of Riyadh. In December, the British government (started early 1915) attempted to cultivate favor with Ibn Saud via its secret agent, Captain William Shakespear, and this resulted in the Treaty of Darin. The Battle of Jarrab was a territorial battle between the Al Sa?ud and their traditional enemies the Al Rashid in January 1915. It was a proxy battle of World War I between the British-supported Sa?udis and the Ottoman-supported Rashidis. The main significance of the battle was the death of Ibn Sa?ud?s British Military Advisor, Captain William Shakespear. The Treaty of Darin, or the Darin Pact, of 1915 was between the United Kingdom and Abdul-Aziz Al Saud (sometimes called Ibn Saud) ruler of Nejd, who would go on to found the Kingdom of Saudi Arabia in 1932. The Treaty was signed on the island of Darin (also known as Tarout Island) in the Persian Gulf, on 26 December 1915 by Abdul-Aziz and Sir Percy Cox on behalf of the British Government. The Treaty made the lands of the House of Saud a British protectorate and attempted to define its boundaries. The British aim of the treaty was to guarantee the sovereignty of Kuwait, Qatar and the Trucial States. Abdul-Aziz agreed not to attack these British protectorates, but gave no undertaking that he would not attack the Sharif of Mecca. The Treaty was the first to give international recognition to the fledgling Saudi state. Also, for the first time in Nejdi history the concept of negotiated borders had been introduced. Additionally, although the British aim was to secure its Gulf protectorates, the Treaty had the unintended consequence of legitimising Saudi control in the adjacent areas. The Treaty was superseded by the Treaty of Jeddah (1927). By the end of World War I almost all of the Arabian Peninsula had been brought into the sphere of British influence.
? Kuwait was a sub-district of the Ottoman Empire when World War I began, but had been under the influence and protection of the British since 1899. Shortly after the war began the British recognized Kuwait as an independent sheikhdom under its protection. On December 2, 1922 the Uqair Protocol, which defined the boundaries between Kuwait and Nejd, was signed by the British Political Agent in Kuwait and Sheikh Ahmad Al-Jaber Al-Sabah on behalf of Kuwait, and by Sultan Abdul Aziz on behalf of Nejd. In this agreement Kuwait lost a large amount of its territory to Nejd. The main objectives of this agreement were to stop Bedouin raids on the borders of Kuwait which originated in Nejd and to contain the northward expansion of Sultan Abdul Aziz of Nejd. In 1932, when the Kingdom of Iraq became an independent state and a member of the League of Nations the borders between Iraq and Kuwait which had been defined in a British Memorandum in 1923 were confirmed by the Council of the League of Nations.
? Bahrain was a British protectorate and had been since 1861. Bahrain had nominally been a part of the Ottoman Empire until 1913 but had in reality been under strong British influence since 1861.
? Qatar had nominally been a vassal state of the Ottoman Empire until 1913 but the British had had influence there since about 1878. Qatar officially became a British protectorate in 1916.
? The Trucial States (now the UAE) was a collection of sheikhdoms which were British protectorates and had been since 1862.
? Muscat and Oman was an independent country which had close military and political ties with the United Kingdom.
? 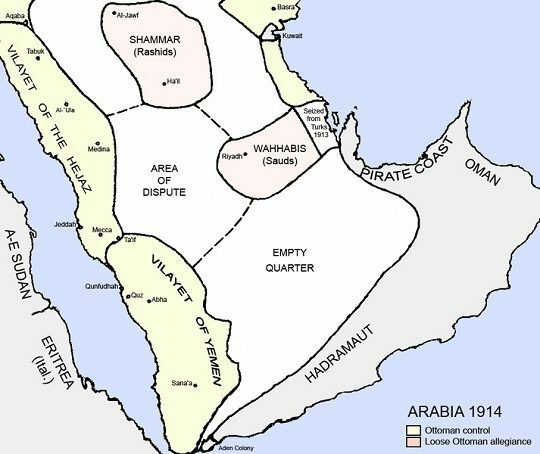 The Empty Quarter, the harsh desert area south of the Trucial States and inland of Muscat and Oman, was claimed by the British to be in their sphere of influence by their establishment of the Blue Line in 1913 and the Violet Line in 1914 which placed the desert area east of these lines in their sphere of influence.
? The Aden Protectorate, which later became known as South Yemen, was a collection of sheikhdoms which were British protectorates and had been since about 1886.
? The Aden Settlement, a strategically important port at the southern tip of the Arabian Peninsula, was ruled by the British as a part of British India and had been since 1839.
? Yemen was a province of the Ottoman Empire which began at the southern tip of the Arabian Peninsula, at the frontier of the Aden Protectorate, and continued about one third of the way up the Red Sea coast of the Arabian Peninsula. Najran, an ancient principality on the northern inland frontier of Yemen, was under the suzerainty of the Imams of Yemen and, therefore, nominally a part of the Ottoman Empire. Asir was the northern district of the Province of Yemen. On April 30, 1915 Sayyid Muhammad ibn Ali al-Idrisi, the leader of the Idrisi dynasty in Asir, concluded a secret military alliance, the Anglo-Idrisi Treaty, with the British and began attacking the Ottoman forces in Asir. When the war ended the Idrisi Emirate of Asir became an independent country recognized by the British Government with Sayyid Muhammad as its ruler. Asir was invaded and occupied by the forces of Abdul Aziz, leader of the Al Saud dynasty in the Nejd, in 1920. The British did not come to their aid. The leader of Yemen, Imam Yahya Muhammad, declared the independence of Yemen after the Ottoman Empire surrendered to the Allies and Ottoman forces withdrew from Yemen. In 1926, Imam Yahya Muhammad declared Yemen to be the Mutawakkilite Kingdom of Yemen (the Kingdom of Yemen) with himself as its king. Najran was invaded and occupied by the forces of Abdul Aziz, then the King of Nejd and the King of Hejaz, in 1926.
? Hejaz, the western coast of the Arabian Peninsula from the border of the Province of Yemen up to and including Aqaba, was a province of the Ottoman Empire until June 10, 1916 when its Ruler (Emir) Sharif Hussein bin Ali, who was also the head of the Hashemite dynasty, declared it to be the independent Kingdom of Hejaz with himself as its king. After an exchange of letters in 1915 and 1916 between Sharif Hussein and the British, which came to be known as the McMahon-Hussein Correspondence, Hussein decided to join the allies in fighting against the Ottoman Empire. Sharif Hussein began to receive financial and military aid from the British, and on June 6, 1916 the Great Arab Revolt against the Ottoman Empire began in Hejaz when King Hussein ordered his forces to attack the Ottoman forces in the Hejaz cities of Ta?if, Mecca and Medina. Four days later Hussein declared the independence of Hejaz. After defeating the Ottoman forces in Ta?if and Mecca, the Arab forces turned their focus towards Damascus. Assisted by French and British officers ? including T. E. Lawrence (Lawrence of Arabia) ? and in cooperation with British Allied forces, they gradually fought their way northward along the Hejaz Railway, reaching Damascus with Allied forces on October 1, 1918. Ottoman forces in Medina were not defeated, but were surrounded, and did not surrender until November, 1919. In 1918, as the Ottoman Empire was nearing defeat, the district of Ma?an, which had been the southernmost district of the Ottoman Province of Syria and neighbored Aqaba, the northernmost district of Hejaz, was annexed to Hejaz by King Hussein. Hussein?s son, Faisal, had used Aqaba and Ma?an during the summer of 1918 as his headquarters and staging area as he led the Great Arab Revolt northwards towards Damascus. The British did not object to this annexation. Relations between King Hussein and the British slowly grew worse after the war due to Hussein?s insistence that the promises the British had made in the McMahon-Hussein Correspondence be kept. The British stopped providing aid to King Hussein in 1924. On March 5, 1924, two days after the Turkish Republic abolished the office of the Caliphate and transferred its powers to the Turkish Parliament, King Hussein declared himself to be the new Caliph. There was a mixed reception to this announcement and it was one of the justifications put forward by Abdul Aziz, then the Sultan of Nejd, when he attacked and conquered the Kingdom of Hejaz in 1924-1925.
? Nejd, the interior of the Arabian Peninsula, was a vassal state of the Ottoman Empire. When World War I began much of the northern area of the Nejd was ruled by the Al Rashid dynasty, who were allied with the Ottoman Empire, and the southern area of the Nejd was ruled by Abdul Aziz ibn Saud of the Al Saud dynasty, who was nominally allied to the Ottoman Empire. Before the war Abdul Aziz had asked the British for assistance so that he could expand his rule. Before the war the British declined his requests because they did not want to antagonize the Ottoman Empire and put their protectorates and interests in the Arabian Peninsula at risk. In 1913 Abdul Aziz annexed Al Hasa, the area along the Persian Gulf between Kuwait and the Trucial States, to Nejd when the Ottoman Empire relaxed its sovereignty over the area. In 1914, after World War I began, the British began negotiations with Abdul Aziz to convince him to join them in fighting against the Ottoman Empire. Abdul Aziz would only agree if the British signed a formal treaty with him, and on December 26, 1915 the Treaty of Darin was signed. In the tresty the British recognized Abdul Aziz as the ruler of Nejd, which became a British protectorate. Abdul Aziz also began to receive financial and military aid from the British at this time but his involvement in the war was limited, only attacking the Al Rashid ruled areas of Nejd. After the end of the war, Abdul Aziz continued to receive financial and military aid from the British and in 1920 his forces invaded and occupied the Idrisi Emirate of Asir after its ruler Sayyid Muhammad died. Abdul Aziz then again attacked the Al Rashid controlled areas of Nejd. His forces defeated the Al Rashid forces in 1921 and took complete control of Nejd in 1922. Abdul Aziz proclaimed himself to be the Sultan of Nejd after completing his conquest of Nejd. During the conquest of the Nejd, Abdul Aziz?s forces also attacked areas which were to the north of the traditional boundaries of Nejd, coming to within 15 miles of Amman in August, 1921. These attacks alarmed the British because there was a danger that Abdul Aziz would conquer the undefined area between the Transjordan territory of Mandatory Palestine and Mandatory Iraq. British forces, especially the RAF had to attack Abdul Aziz?s forces several times to force them back and to send a message to Abdul Aziz to stop attacks in this area. The British also began a diplomatic offensive. On May 5, 1922, the Treaty of Mohammara, which loosely defined the boundaries between Nejd and Iraq, and on December 2, 1922 the Uqair Protocol, which more clearly defined the boundaries between Nejd and Mandatory Iraq, were signed by Abdul Aziz, the British and the King of Iraq. The main objectives of these agreements were to end Bedouin raids on the borders of Kuwait and to contain the northward expansion of Abdul Aziz. At the British-organized Kuwait Conference (Dec. 17, 1923 ? Apr. 3, 1924) the British Government?s objectives were to finalize the Iraq-Nejd border, to solidify the Hejaz-Nejd border, and to establish Iraq-Transjordan, Transjordan-Nejd and Transjordan-Hejaz borders. The conference was unsuccessful primarily because Abdul Aziz felt that this was being done for the benefit of the three Hashemite rulers ? King Hussein of Hejaz and his sons the Emir of Transjordan and the King of Iraq. After the Kuwait Conference ended, Abdul Aziz attacked Hejaz. King Hussein abdicated on October 3, 1924 after suffering military defeats, but he retained his religious titles. His son, Ali bin Hussein, became the King of Hejaz. Following his abdication Hussein moved to Aqaba. The situation was in danger of getting out of control. – Hussein?s living in Aqaba made it likely that Abdul Aziz would shift his attacks on Hejaz from its southern and central districts to its northernmost districts, Aqaba and Ma?an. – If Abdul Aziz conquered Hejaz, which included Aqaba and Ma?an, he would share a border with the Palestine territory of Mandatory Palestine. – If Abdul Aziz attacked and occupied the undefined desert area between Mandatory Iraq and the Transjordan territory of Mandatory Palestine, this would complicate British plans for an oil pipeline and rail connection between Iraq and the Mediterranean and Abdul Aziz would share a border with Mandatory Syria. – The conflict could easily expand because the Emir of Transjordan and the King of Iraq, who were both Hussein?s sons, could join the fighting to assist their brother, the King of Hejaz, and to protect their father. In order to avoid having to enter the conflict militarily the British began intense efforts to resolve the situation. – The British recognized that Abdul Aziz was the new local power in the Arabian Peninsula, warned him not to attack Aqaba or Ma?an, and temporarily stopped providing aid to him. – Discussions began between Hussein and the British and on June 18, 1925 Hussein agreed to go into exile in Cyprus. – Transjordan annexed the Aqaba and Ma?an districts of Hejaz in July, 1925. – On November 1, 1925 the Bahra Agreement was signed between the State of Nejd and the State of Iraq, which was represented by the British, to resolve Nejd-Iraqi border issues. – On November 2, 1925 the Hadda Agreement was signed between the Government of Nejd and the Government of Transjordan, which was represented by the British, to establish the border between the Transjordan territory of Mandatory Palestine and Nejd. On December 19, 1925 Abdul Aziz?s forces defeated the forces of King Ali of Hejaz who then fled to Iraq where his brother was the king, and the border between the Transjordan territory of Mandatory Palestine and Hejaz remained unresolved. Abdul Aziz then proclaimed himself to be the King of Nejd and the King of Hejaz. The British did not come to the aid of either King Hussein of Hejaz or King Ali of Hejaz even though they had helped the British defeat the Ottoman Empire during World War I. In 1926, Abdul Aziz?s forces invaded and occupied Najran. On May 20, 1927 the Treaty of Jeddah was signed by King Abdul Aziz and the British. The British recognized the complete independence of the Kingdom of Hejaz and the Kingdom of Nejd and the sovereignty of King Abdul Aziz, thus ending the British protectorate of Nejd. King Abdul Aziz agreed to maintain ?friendly and peaceful relations? with Kuwait, Bahrain, Qatar and Oman who had ?special treaty relations? with the British. Abdul Aziz also agreed to accept the status quo of the Hejaz-Transjordan border. Conflict between Abdul Aziz and the Ikhwan, his main military force, began to intensify in 1927. Battles between Abdul Aziz?s forces and the Ikhwan began, but Abdul Aziz finally defeated the Ikhwan in 1930 and completed the consolidation of his power over most of the Arabian Peninsula. In 1932 the Kingdom of Nejd and the Kingdom of Hejaz were united to form the Kingdom of Saudi Arabia and Abdul Aziz became the King of Saudi Arabia.